GRAMMY® Award-winning THIRD DAY have just announced their upcoming tour plans. In support of their most recent album Lead Us Back: Songs of Worship, the band will embark on the “Lead Us Back Tour.” Hitting 22 markets this fall, the tour will kick off in Wichita, KS on October 1 and run through November 21 in Columbia, SC. The tour will pick back up in spring 2016. Brandon Heath is set to join the fall leg of the tour along with Warren Barfield who will speak on behalf of Food For The Hungry. The latest tour dates are below, and tickets will go on sale beginning this Friday, July 17 in select markets. In other touring news, THIRD DAY wrapped their successful spring U.S. and Canadian “Soul On Fire Tour” in May. In June they sold out two of their well-known THIRD DAY & FRIENDS shows – at Atlanta’s Gwinnett Arena on June 6 and Denver’s Red Rocks Amphitheatre on June 14. Leading up to the fall tour, THIRD DAY will appear at numerous summer festivals as well as headline two post-MLB game faith-based concerts in August. On Sunday, August 2 they will perform at Cincinnati’s Great American Ballpark after the Reds game and August 9 after the Braves game at Turner Field in their hometown of Atlanta. For more information and how to purchase tickets, please click here. Fans at the upcoming shows will surely get to hear THIRD DAY’s latest hit single, “Soul On Fire,” which was No. 1 for 11 weeks and is charting on both the AC Monitored and National Audience Charts. The song’s music video is below. The band’s next single, “Your Words,” will go for adds in August. Both songs are found on THIRD DAY’s latest release Lead Us Back: Songs of Worship (March 3, 2015; Essential Records). The album, their latest worship offering in more than ten years, debuted top 20 on Billboard’s Top 200 Album Chart and No. 1 on the Christian Album Chart its first week. 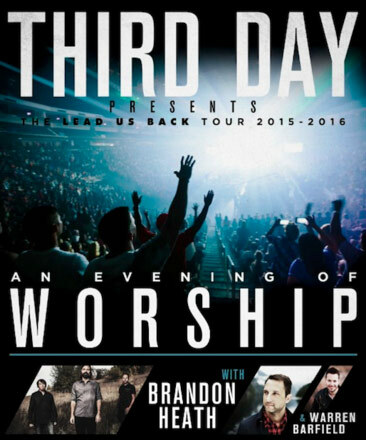 To find out more about THIRD DAY and if they’re performing in a city near you, please visit ThirdDay.com. ABOUT BRANDON HEATH: Since Brandon Heath’s debut on Reunion Records with Don’t Get Comfortable (2006), he has become one of Christian music’s most beloved and respected artists and songwriters. Heath has garnered an Emmy Award, five GRAMMY® nominations and an American Music Award nomination. He has been honored as a six-time GMA Dove Award recipient, including “Male Vocalist of the Year” (2009 and 2010), BMI’s 2014 Songwriter of the Year, and earned multiple additional songwriting honors. His award-winning songs and signature vocals reflect a soaring radio career that includes top hits “I’m Not Who I Was,” “Wait and See,” the 2009 GMA Dove Award-winning Song of the Year “Give Me Your Eyes,” the eight-week chart topper “Your Love,” “The Light In Me,” and many others. Heath, a Nashville native, first began writing at age 13. His artistry and ability to connect with audiences have compelled countless media outlets across the nation to platform his story and music. Highlights include coverage in The New York Times, Billboard, The Wall Street Journal, Relevant, CBS Evening News and The Discovery Channel, and as a presenter on the 54th Annual GRAMMY® Awards. Posted on July 18, 2015 at 11:03 am in Louie Giglio	| RSS feed You can	trackback	from your own site.